Using the right media for your application is the difference between chucking dirt and ensuring consistency and repeatability. 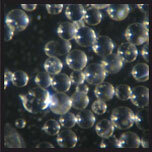 The abrasive media is the most significant variable in MicroBlasting. Abrasives that are free of impurities produce superior results. Comco maintains strict quality control during every phase of powder processing, ensuring each lot of precision abrasive meets our high expectations. Need to carefully remove polymer coating from a fragile substrate? Want erosive depth control to 70 nm? Need to texture to a specific Ra value? Consistent results start by using a carefully-sized abrasive free of impurities. A bottle of Comco Sodium Bicarbonate is not the same as your supermarket baking soda or industrial abrasive supply equivalent. These abrasives are made for different purposes. 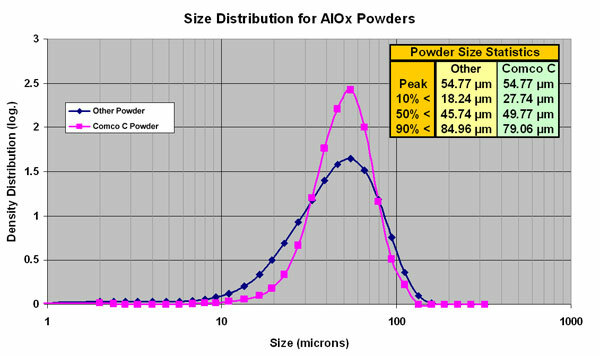 MicroBlasting works on a micro-scale, so it requires an abrasive that maintains a tight classification centered within a narrow distribution curve. 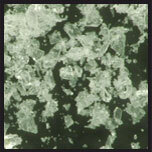 Any variance in particle size or chemical composition impacts the surface of the targeted part. It is impossible to determine abrasive performance simply by looking at it. Regular testing of our abrasive media allows us to know exactly how it will affect your part’s surface. We use proprietary systems and tools to maintain the purity of all our abrasives. Our inspection process looks at specific characteristics like particle size distribution and moisture content. Each lot of abrasive is tracked. 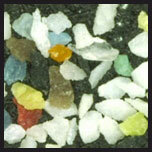 Three components drive abrasive media selection: particle shape, particle size, and particle hardness. For instance, a sharp and hard abrasive like aluminum oxide is an excellent cutting abrasive, ideal for working on metals or hard, brittle parts. 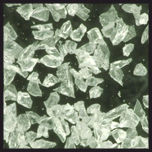 Sodium bicarbonate’s softer needle-like shapes make it perfect for abrading pliable materials. 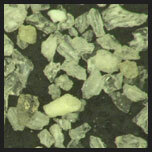 Each abrasive’s unique properties produce distinct results. 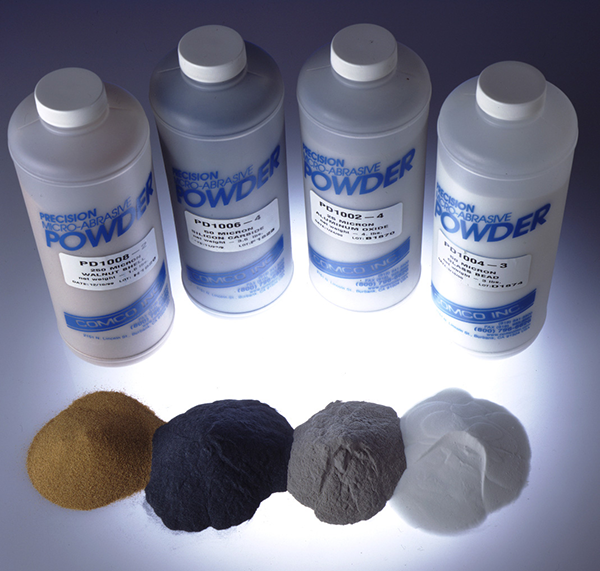 Comco offers a wide range of abrasive types and sizes to suit almost any application. To find the right abrasive for your application, see our Abrasive Media Guide below or contact our Applications Engineers for recommendations. The most commonly used cutting abrasive. The shape and hardness of the particle make it an excellent choice when working with metals or hard, brittle parts. Common uses include cutting, deburring and the preparation of surfaces. This media is manufactured by crushing glass beads. The result is a mild abrasive media with lots of shard-like edges. 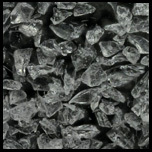 Crushed glass is used where only a light degree of a abrading is desired. Used where preservation of tight tolerances is critical combined with the need to relieve stresses. It is also used to perform light deburring or to apply a satin-like finish on a part. The spherical shape keeps it from cutting into surfaces, so it is commonly used to relieve stresses by “pounding” the part’s surface. Created by grinding and carefully sizing recycled plastic. Similar in size to walnut shell, it makes an effective tool to deburr machined plastic parts without causing dimensional changes. It can also be used to remove conformal coatings. Pumice is a volcanic ash that is formed when lava is permeated with gas bubbles. Lava has similar properties and chemical make-up as glass, which makes it very abrasive. Unlike glass, however, pumice is a soft abrasive. The most aggressive media used for micro-abrasive blasting, with a hardness just under that of a diamond. Typically used where very fast material removal is a requirement. An excellent abrasive for deburring stainless steel and titanium parts. One of the softest abrasives. Needle-like or “monoclinic” shapes make it excellent for abrading pliable materials. Particles cut through soft surfaces where a blockier particle would tend to bounce off. It is used to selectively remove coatings on circuit boards without damaging components. Manufactured by grinding nut shells. 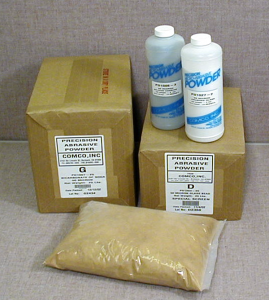 It has a much larger size than sodium bicarbonate, approximately 200 to 250 microns. Walnut shell will quickly remove polymer coatings from circuit board surfaces and can also be used to deflash plastic parts. This media is manufactured by polymerizing and crushing wheat starch. 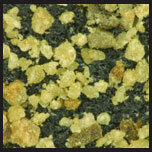 The result is a mild abrasive media with lots of shard-like edges. Wheat starch is used in applications that require a delicate blast to remove coatings and contamination without harming the underlying surface. 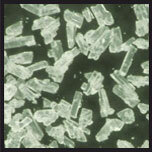 Contaminants and moisture degrade the effectiveness of micro-abrasive media. Comco expertly packages all abrasive in heat-sealed bags and containers for protection against any contamination or moisture during shipment and storage. From 2-4lb bottles to bulk containers, Comco offers a wide range of package sizes for the occasional user to the busy production floor. Sometimes a bigger tank is not enough. That’s why our engineers developed AutoFill—so you don’t have to worry about running out of abrasive mid-cycle or, worse, halting production to refill the tank. Sensors detect when abrasive levels drop below a set point, then automatically trigger a refill from a 15-gallon abrasive drum. Drum replacement during the blast cycle allows continuous operation. 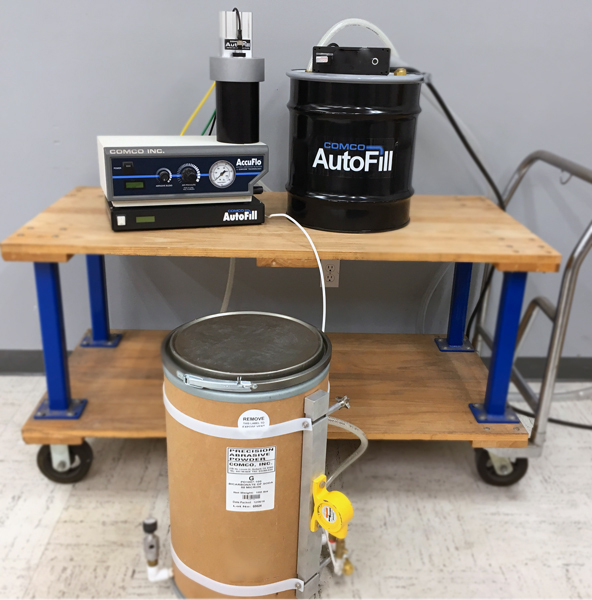 A single AutoFill system can be expanded to handle several AccuFlo units, all drawing from the same drum of abrasive.